During a recent battlefield tour in the Niagara region, I was received a copy of the regimental history of The Royal Scots (The Royal Regiment), or the 1st Foot, or Royal Scots, as they were known during the War of 1812. Although the passage of the regiment’s service during the War of 1812 was brief and eclipsed by the narrative of campaigns in the Iberian Peninsula, it did include a remarkable entry about Captain John Wilson following the battle of Chippawa, including an image of an oil painting by George Jones, RA (Royal Academy) depicting that event. The battle of Chippawa was the first major engagement between Major-General Jacob Brown’s Left Division of the United States Army and the Right Division of Upper Canada led by Major-General Phineas Riall. Both commanders committed a brigade onto the plain of Chippawa during the afternoon of 5 July 1814. The three British units included the 1/1st Foot, 1/8th Foot and 100th Foot. The 1st Foot formed the centre of the British line and its pre-battle reported strength was 500 all ranks under Lt Col John Gordon. Heavily engaged during the battle, the Royals suffered one officer and 77 other ranks killed and eight officers and 144 other ranks wounded. Two officers were taken prisoner and 77 solders were reported as missing. Captain John Morillyon Wilson was one of the two severely wounded officers that were taken prisoner. He had been wounded seven times and left for dead on the battlefield. A native armed with a knife then attacked him, but Wilson killed his attacker and was then kept alive by a native woman from a nearby village before being taken prisoner. He was exchanged in February 1815. Wilson is described as “one of the more colourful officers in the Regiment’s history.” He was born in 1783 and joined the Royal Navy, serving off Egypt where he was wounded three times. The last wound resulted into total deafness and in 1803 he was invalided out of the navy. Then having recovered sufficiently, Wilson joined the 40th Foot in 1804 before moving to the 63rd Foot in January 1807. Later that year, he was a captain in the 1st Foot and serving with the 3rd Battalion at Walcheren in 1809, where he was wounded twice again leading the grenadier company during the assault on Flushing. In 1810, he was brought before court martial for using language “subversive to discipline, and disrespectful to the character of Colonel Barnes,” his commanding officer. Although acquitted of conduct unbecoming a gentlemen, he was found guilty of using language that was disrespectful and sentenced to a public reprimand. Wilson later served in the Iberian Peninsula and then was sent to British North America, where he participated in the following actions: Sackets Harbor, Fort George blockade, Fort Niagara, Black Rock and Chippawa. Wilson eventually rose to lieutenant-colonel, was made a Companion of the Order of the Bath and Knight of the Royal Hanoverian Order. He became the adjutant at the Royal Hospital Chelsea in 1822 and was still serving there when he died in 1868. During his 70-year career, he was wounded thirteen times and carried two musket balls in his body to his death. 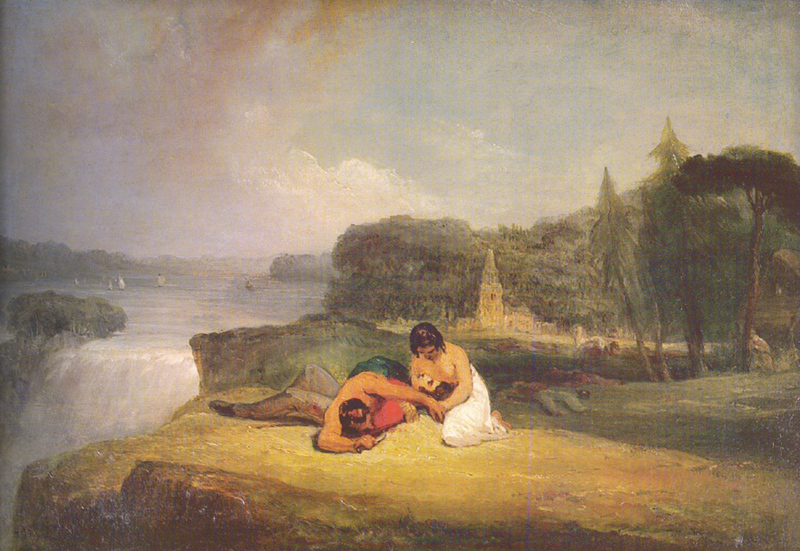 The image accompanying this article is an oil painting by George Jones, RA (1786-1869), showing Captain John Wilson being saved by the native woman after the battle of Chippawa. George Jones also served in the Peninsula, which instilled him with a love of painting battle scenes and in 1820 he received a prize from the British Institution for his painting of the Battle of Waterloo. He also did a painting of the Battle of Vittoria. Jones later served as Librarian and Keeper of the Royal Academy. Jones never visited the site of the battle of Chippawa and probably based his painting on material provided from the Royal Scots. He also injected a healthy dose of artistic licence as his painting depicts Wilson’s rescue as occurring near the falls, which are actually several miles north of the battlefield. There were several buildings on the battlefield, but no church. Jones likely wanted to appeal to what his audience expected to see in a painting from the Niagara. One wonders where Captain Wilson eventually found himself after the battle, as the Americans held the field at then end of the day and would probably have collected him quickly. Despite these questions, the painting is an interesting piece of art related to the 1814 Niagara campaign. The image of the work by George Jones is reproduced here with the permission of the Commanding Officer of the The Royal Scots (The Royal Regiment). For more information on this fascinating battle, consult the standard work by Donald E. Graves. Red Coats & Grey Jackets: The Battle of Chippawa, 5 July 1814. Toronto: Dundurn Press, 1994. Note the casualty figures given are higher than reported in Graves’ study and come from Robert H. Paterson. Pontius Pilates Bodyguard: A History of he First or the Royal Regiment of Foot, The Royal Scots (The Royal Regiment), Volume One: 1633-1918. Edinburgh: The Royal Scots Historical Committee, p. 112. Stuart Sutherland. His Majesty’s Gentlemen: A Directory of British Regular Army Officers of the War of 1812. Toronto: Iser Publications, 2000, p. 381. Robert H. Paterson. Pontius Pilates Bodyguard: A History of he First or the Royal Regiment of Foot, The Royal Scots (The Royal Regiment), Volume One: 1633-1918. Edinburgh: The Royal Scots Historical Committee, p. 111, 112 and plate 16.